Songs of Eretz Poetry Review is pleased to present "Tiger Lilies" by Carol Hamilton, Poet of the Month. Ms. Hamilton will also be serving as the guest judge for the Songs of Eretz Poetry Award Contest, which will run from September 1 to October 15, 2015. A detailed biography of Ms. Hamilton may be found here: http://eretzsongs.blogspot.com/2015/08/songs-of-eretz-poetry-review-poet-of.html. The contest guidelines may be previewed here: http://eretzsongs.blogspot.com/p/songs-of-eretz.html. corner of soil I allow them. I do nothing in return. Poet’s Notes: From early spring until autumn I have a series of various kinds of lilies that bloom. I love them, as they seem quite willing to take care of themselves. This little poem plays with some alliteration and some internal rhyme. It is, I hope, a playful piece of work. Editor’s Note: This poem reminds me of how every spring I await the return of my perennials with eager anticipation. I also “do nothing” to encourage them. 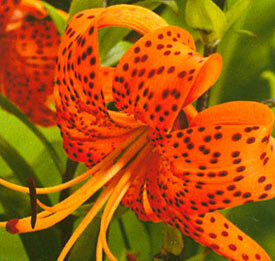 “Tiger Lilies” was originally published in Red Bluff News.